You can't be closer to more fun than this location! Mama’s Fish House and its gorgeous beach is 100 steps away. Mama’s is the neighborhood, kid-friendly and never crowded beach right here. Walkable and world-famous HO'OKIPA is just beyond Mama's. 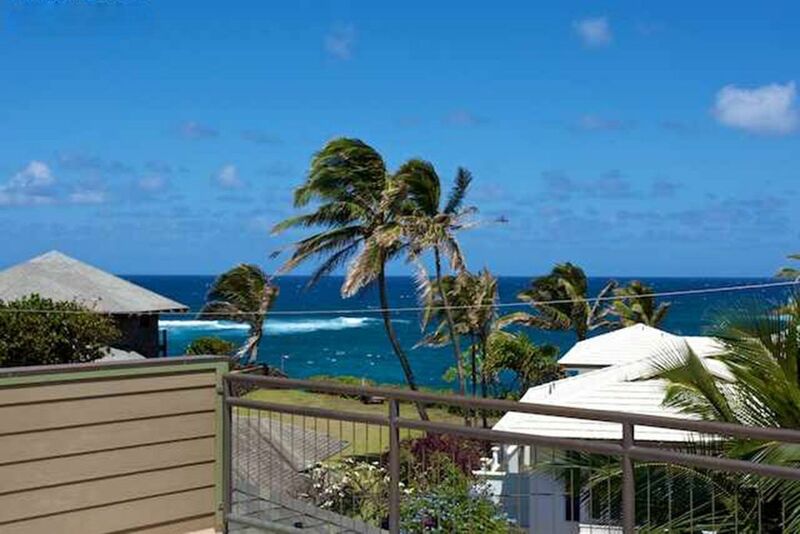 Less than five minutes away is historic PAIA TOWN with shopping, dining, art galleries and beaches. In Paia, you will find more beaches for swimming or sunning at Tavares Bay, Paia Bay or at Baldwin Beach. Just a few minutes past Baldwin are more secluded beaches and amazing windsurfing at Spreckelsville Beach. Here you are in the center of the active Northshore Maui life-style, exactly where you want to be. You can be surfing, windsurfing, stand-up paddling, kiteboarding or swimming in the ocean quicker than just about anywhere on Maui. Our location is top notch! The house is gated with a large lanai for family meals, 2 BBQ's, professional kitchen, roof top deck with 360 degree views. Enjoy Australian Cherry wood floors and high ceilings upstairs, plus views to the sea. * 4 Bedrooms w/ seven beds (1 K, 2 Q, 2 Doubles, 2 Twins). Paia Town is very close. The house is large and comfortable with great outdoor spaces for grilling, eating and enjoying the Maui weather. The upstairs deck offers beautiful views. Daniela met us when we first arrived and was very helpful letting us know about the property and its features. While the kitchen is well supplied with dishes, silverware, etc, there are few staples other than salt and some spices. There is a master bedroom upstairs with en-suite bathroom but only a powder room for the second upstairs bedroom. The downstairs has 3 bedrooms with 2 baths. Location is close enough to walk to downtown Paia, but not safe enough on the busy, narrow road. The Kuau Store is a short easy walk with very friendly staff and has a good variety of basics along with a deli/coffee shop. narween o.Where do you live? This is the best VRBO we have rented in North America. It is professionally maintained to a high standard, very well managed and very very clean. Location: The house is very well located for walking to a friendly small beach full of locals that is perfect for toddlers and is a turtle sanctuary. It is also a very short walk to a fantastic local gourmet store with groceries & a deli, Kuau Store (we ate poke bowls & hot plates from here every other day). It is basically two houses - the upper and lower levels each have their own kitchen, living room (with big flat screen TV) & laundry facilities & doors can be closed so the two areas feel very private. There are bedrooms & bathrooms both upstairs & down. We were traveling with our toddler and our teen, so everyone enjoyed having a sense of privacy. The upper kitchen has a great Viking range & stainless appliances, everything you need for cooking is in the house, even a cheese grater, blender, multiple chopping boards. The mattresses are of good quality, medium firm so great for your back, neither too hard nor too soft & all of the bedding is very clean, fresh & high quality (I notice these things because I have a bad back & bad dust mite allergies & I was 100% comfortable in this bedding). There is an upper patio for eating off the kitchen/living room, it's a bit tight out there because the furniture is quite large but that said, 6-8 people can eat out there, it's a nice option to have at meal times. All the indoor & outdoor furniture is comfortable, clean & in good repair. The property has a high fence with coded gate for pedestrians & clickers for the car gate so it feels safe & contained (important with a toddler). The windows are all screened & there is a constant strong breeze so it never got unbearably hot. There are ceiling fans in every room, plus central AC upstairs. 6 girlfriends spent a week here in April. It was perfect! The house is beautiful, clean, spacious and comfortable. We all had our own beds, and only 2 had to share rooms. The kitchen is extremely well equipped (although we really didn't cook), and there is another full kitchen downstairs. 3 full baths and a half bath, so no one was ever waiting. We used the upstairs outside seating, but there is lots of outside seating downstairs as well. It was really windy when we were there, but the upstairs roof patio has unbelievable views at sunrise, sunset, and all day long. We loved the location, we loved having our little beach just steps from the house, and the corner store at the end of the road is actually a high end little place with awesome poke bowls, sandwiches, wine, beer, whatever you need! None of us had ever been to Maui before, and we were a bit concerned that we would be out of the way of everything in this location. It ended up being the perfect location! Right on the Road to Hana, easy to get to Haleakala, close to the surfers and turtles, and close to beautiful beaches. We loved being close to the town of Paia, and we explored other towns nearby as well. Definitely didn't feel like we had enough time. We had great communication with the rental company, they were very responsive when we arrived, and they met us and showed us around. Everything was easy and amazing. Thanks for sharing this house!! We stayed with a total of 8 family members for 10 nights at Maui Winds, and could not have asked for a more perfect stay. The home was wonderful, with plenty of room upstairs and downstairs for our whole family. It’s large kitchen allowed us to make many family meals during our stay, which usually involved one of the large grills. The home is beautifully appointed, and the semi private beach is mere steps away. We saw sea turtles daily on this beach, and it provided a change from the busier beaches. It is away from the more resort area of the island, which we enjoyed, and it is at the beginning of The Road to Hana. Paia is a delightful town with plenty of shopping and dining. We visited other beaches, sailed and snorkeled, attended a luau, and none of the activities were more than 30 minutes away. The staff was very responsive, and delightful to work with! We can’t wait to visit again! Great location and perfect house. Staff responded to all our needs. Would be honored to be able to stay here again. The beach was special with large turtles and great snorkeling right next to house. Fantastic house and great location. The house was perfect for our group. Lots of room for everyone and the separate upstairs and downstairs living and outdoor areas meant everyone could have a bit of space to themselves if they wanted. The upstairs area has a large living, dining, kitchen as well as deck and BBQ area so plenty of room when the crew is all together. The owners & managers were great to deal with and very helpful to us before and after we booked and also after we arrived. The Kuau General Store is just a short walk up the road which is very handy. It has excellent coffee and a good selection of wines and beers at reasonable prices. Paia is a very cool and chilled little town with some great restaurants, bars and cafes. Staying at Maui Winds, Paia was the highlight of our 3 island Hawaii holiday.